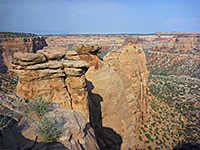 Colorado National Monument has a few short paths along the plateau rim and one backcountry route (Black Ridge Trail) higher in the hills to the west, but the best trails descend into the sheer-walled canyons for which the area is famous. Monument Canyon is by far the most popular of such routes; others include Ute Canyon and No Thoroughfare Canyon. 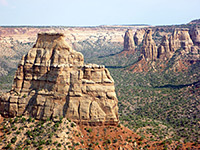 The Colorado National Monument map indicates the trail locations. Alcove Nature Trail 0.45 50 Over 30 interpretive notices along the Alcove Nature Trail describe the plants, animals and geology of this high desert region. The path runs close to the road at the foot of sandstone cliffs, ending at a cool, narrow sandstone alcove. Black Ridge Trail 6.1 700 The Black Ridge Trail is the only hiking route in the national monument which does not encounter the deep sandstone canyons for which the area is famous; instead it crosses a rolling, mostly wooded landscape of mesas and ravines, on the west side of the scenic drive. Part of the route exits the park into the adjacent BLM land. 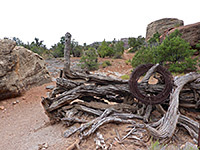 A 0.75 mile spur links to the Upper Monument Canyon trailhead about half way along, but all one-way hikes would require a car shuttle to return to the trailhead. Most of the route follows an old vehicle track, so is wide and easy to follow. Canyon Rim Trail 1.1 70 Starting on the far side of the visitor center, the Canyon Rim Trail descends a little to a viewpoint on the edge of Wedding Canyon, then follows the top of the cliffs eastwards, for gradually better views. It ends at another overlook (Book Cliffs View) but the hike can be extended by the nearby Window Rock Trail, continuing further east to the tip of a promontory. Coke Ovens Trail 0.5 160 From the busy trailhead at the upper end of Monument Canyon, this short path descends a little way down the drainage then follows a level bench out to a fenced viewpoint of the Coke Ovens - a series of smooth conical domes that have been eroded out of the yellow-brown Wingate sandstone. The overlook is still high above the canyon, and has excellent views up and down. Corkscrew Trail 3.3 (loop) 760 Anti-clockwise is the suggested direction for hiking the Corkscrew Loop; from the Wildwood Drive trailhead along the northeast edge of the national monument the path climbs gently for 0.5 miles to a junction, then more steeply for another half mile to a second intersection, with the route to Liberty Cap. Turning left (south), the trail traverses a hillside for a little way, at the foot of steep cliffs, then winds back down, rejoining the route at the first junction. Devils Kitchen 0.7 100 Devils Kitchen is a small group of sandstone spires, on a low ridge with long distance views in all directions. The location is easily reached, by the first 0.25 miles of the No Thoroughfare Canyon Trail, across a grassy valley, and then another 0.25 miles on a spur trail, ascending a little over slickrock. Echo Canyon Trail 1.3 300 The Echo Canyon Trail follows a short box canyon to the cool, sheltered alcove (and seasonal waterfall) at its upper end. The route starts across open flats and slickrock but most is close to the bushy streambed, which is lined by many wildflowers in spring. Liberty Cap Trail 7 1,700 Although the full distance is a rather long 7 miles, most people hike just the lower 1.5 miles of the Liberty Cap Trail, from its start point in the lowlands east of the national monument, steeply up to a high promontory overlooking the lower end of Ute Canyon. Beyond here, the route (following an old vehicle track) is mostly across a wooded mesa, ascending more gradually. Monument Canyon Trail 6 1,440 This popular trail has two start points, at the upper and lower ends of the canyon. The higher trailhead is busier, along the Rim Rock Drive; from here the path descends quite steeply down a side ravine, below the Coke Ovens, then levels out and turns north, contouring around some other tributaries while staying a little way above the streamway. The last section drops down again quite sharply, to the east entrance of the canyon, then skirts a residential area and reaches the southern trailhead near Hwy 340. Just the upper 2.5 miles makes for a good short hike, as far as the base of Independence Monument. No Thoroughfare Canyon Trail 8.3 1,750 The hike all the way along No Thoroughfare Canyon is 8.3 miles, the longest in the national monument, but most is through a wide, little changing ravine, with the main point of interest being the steep climb at the upper end. Instead most visitors see just the lowest 1.8 miles, which contain several seasonal pools and a waterfall. The trail is maintained to this point, but rougher, less used and unmaintained thereafter. Old Gordon Trail 4 1,600 One of five hiking routes beginning at the Devils Kitchen parking area near the east entrance to the national monument, the lightly used Old Gordon Trail climbs steadily up the sloping plateau on the south side of No Thoroughfare Canyon, not generally close to the canyon rim but still with good views since the surroundings are lightly wooded - a mix of slickrock, small ridges and sand dunes. Otto's Trail 0.5 110 Another of the short routes near the visitor center, Otto's Trail heads east from the scenic drive along a narrowing promontory, descending slightly, ending at a fenced, rocky overlook directly opposite the Pipe Organ formation. 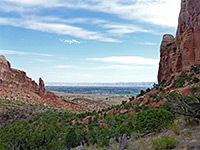 The latter section of the path has excellent views up and down Monument Canyon, and of Independence Monument a short distance south. Serpents Trail 1.75 770 As its name suggests the Serpents Trail has many tight switchbacks, following the course of an old road - once the only entrance to the monument - up the cliffs on the north side of No Thoroughfare Canyon. 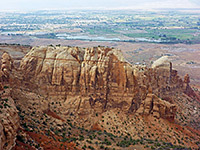 The route has good views east across Grand Junction and the Colorado River valley. Ute Canyon Trail 4.5 880 This little used, unmaintained trail begins along Rim Rock Drive, descending steeply via many switchbacks to the bushy streambed in the upper end of Ute Canyon, which is followed downstream for several miles, past the large detached slab of Fallen Rock, then northeastwards all the way to the mouth of the canyon, joining the Corkscrew Trail. From here it is 1.2 miles to the Wildwood Trailhead on the east side of the national monument. Wedding Canyon Trail 2.5 680 The route through Wedding Canyon is one of the national monument's unmaintained paths but the terrain is still relatively easy. The trail crosses sagebrush flats then enters the lower end of the canyon which is followed southwards to the base of Independence Monument, meeting with the busier path down adjacent Monument Canyon. This enables a 4.5 mile loop hike, providing an alternative way back to the trailhead along Hwy 340. Window Rock Trail 0.25 60 This very short trail descends gently through lightly wooded surroundings to a railing-protected viewpoint on the rim of Monument Canyon, adjacent to a small natural arch (Window Rock) which has formed at the top of the Wingate sandstone cliffs. There are good long distance views over the northern section of the national monument, and across to the Book Cliffs.